So, I wait. He’d estimated that by end-of-day Friday I could start to put things right in my balcony garden. Of course, best laid plans and all, we had a very stormy Friday and they weren’t able to do any work on the building at all. I’m keeping my fingers crossed that the sun will shine on their efforts tomorrow. Just when I was about ready to start kicking pots in frustration, my cat — running full speed — hurdled over a flat of leftover plants AND a small container of catnip. I couldn’t help but smile. If he can make sport out of the temporary inconvenience, I should be able to do the same. 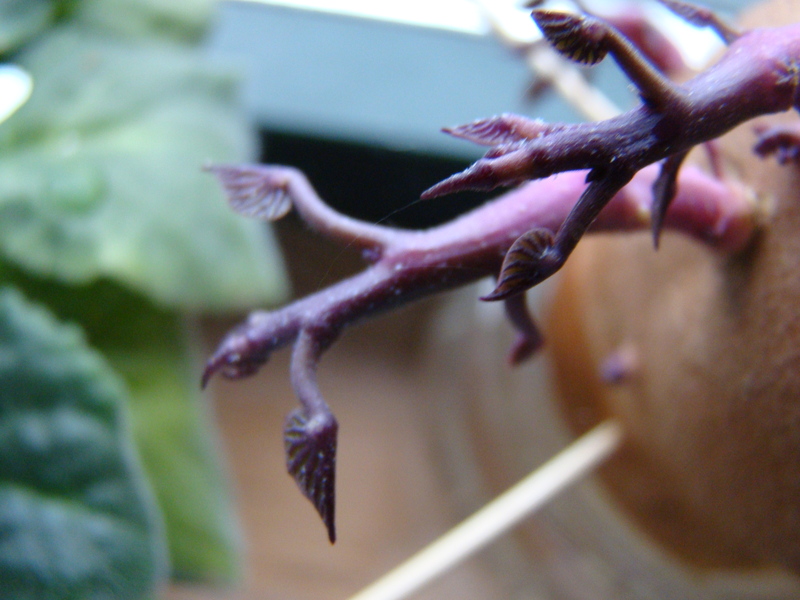 In that spirit I turned my attention toward a minor victory: my sweet potato vine project, which is going gangbusters. The top photo is how it looks today; the second photo is my June 4 status update, and the final photo is what it looked like when we started on May 25. Unbelievable, right! When I gazed through all those heart-shaped leaves at the pouring rain today I couldn’t help but flashback to my childhood — back to the days when it was hip to own a full set of encyclopedias and all the ancillary educational tomes those companies sold. (It was also hip to use the term “hip.”) I remember one volume geared toward kids that offered up fun learning projects for days when you were shut in. As I’ve been asked about garden projects suitable for children, so far, this one seems ideal. It’s low maintenance; you just have to change out the old water for fresh every couple of days or so. 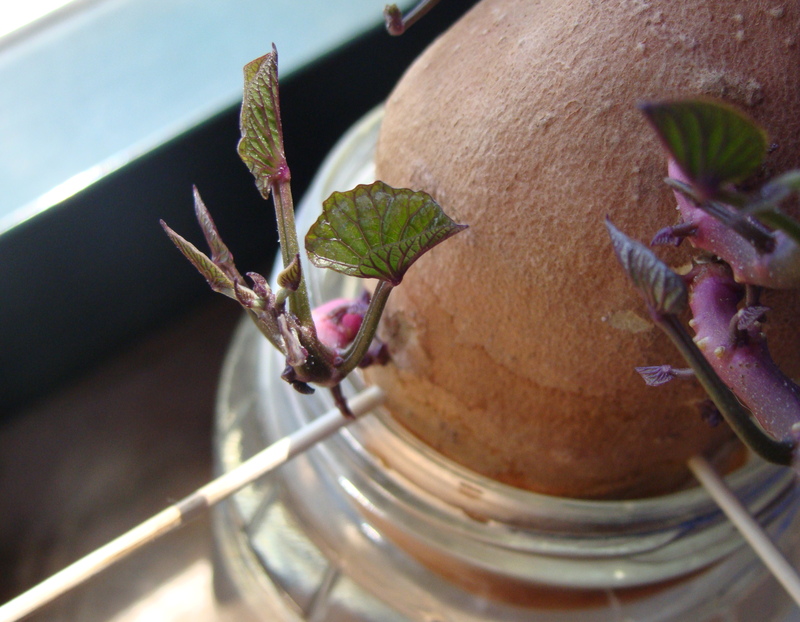 And you can see results fast: just three weeks after inception this potato has completely transformed itself! If I’m amazed, doubtless your kids will be, too. Lovely post. It brought back memories of how miraculous it seemed to make a plant from a potato. Thanks. I am so pinching this idea!! Avis! This is so timely. A peddlar (farmer herself) just sold me some purple sweet potatoes. I immediately thought of you! And now I see this post, I am so exciting to tell you that I have planted two sweet potatoes now. But I just put about 1inch of the bottom of the sweet potatoes into the soil as recommended by the farmer. I will post the result later 😉 But I really wish that my result is same of yours! Btw, what container size are planning to repot into? 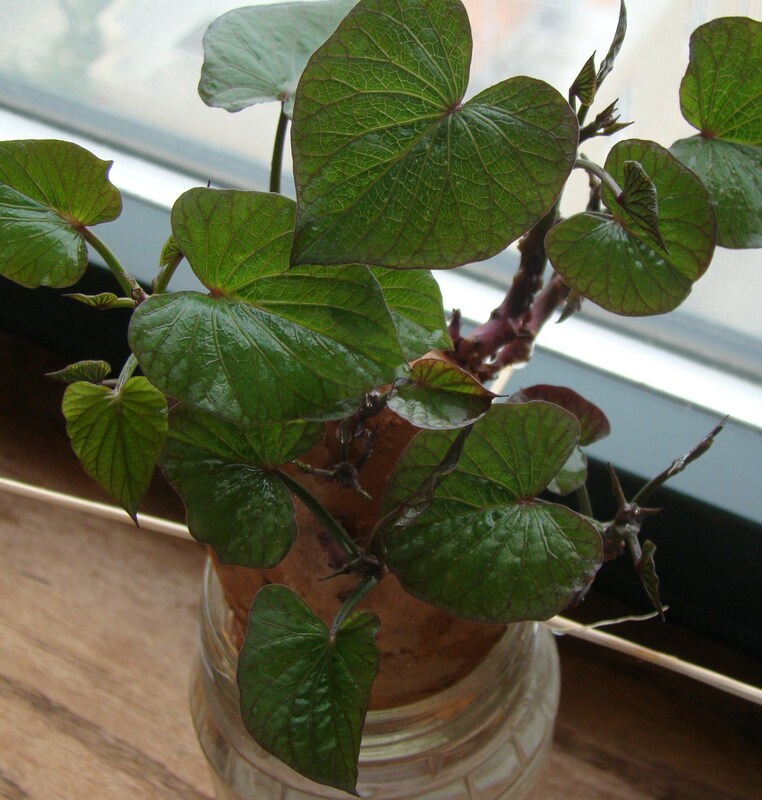 I mean are you going to go for just having this plant as a ornamental plant or for growing sweet potato also. I don’t think I’m going to attempt growing potatoes. I think it’ll just be ornamental. I haven’t researched it, so I’m not sure if this will work, but I thought that maybe by next year I’ll be able to root it and put it in the garden instead of buying sweet potato vine. That looks like awesome fun. And I wanted to commiserate with your plant relocations. It hasn’t been the easiest year for lots of gardens – weather, renos and many other factors are conspiring against the plants it seems. Hang in there! Thanks for the sympathy — and encouragement! I put my plants outside on Sunday and we finally have a week of 80 degree temps forecast in downtown Chicago. I hope my plants will be able to make up for lost time and get their grow on. Cheers! a great post. thanks for the idea. I used to do a similar thing with an avocado. And the moral of the post: you simply can’t predict what cats, builders and the weather are going to do. Great idea! I loved seeing the different stages in your potato. I think this is a great project to do with kids, too, and see the miracles of growing. Fun post. Will do! I’m writing a post right now, and it should be up soon!